Non-medicinal ingredients: gelatin, glycerol, water, carnauba wax, beeswax, shellac. AOR™ guarantees that all ingredients have been declared on the label ... Contains no wheat, gluten, nuts, peanuts, sesame seeds, sulphites, mustard, soy, eggs, fish, shellfish. This exclusive high potency oil formulation is available to healthcare practitioner only. Offering high potency, extracts of peppermint, thyme, and oregano oil standardized to their gastro-protective/therapeutic constituents- menthol, thymol, and carvacol respectively. For hundreds of years traditional herbalists have used peppermint, thyme, and oregano to relieve dyspepsia, colic, and gastrointestinal upset. However, their use extends to the management of small intestinal bacterial overgrowth, fungal overgrowth for the eradication any dysbiotic microbes. Emerging research has identified active ingredients menthol, thymol, and carvacol respectively from these botanicals in the disruption and eradication of various pathogens. 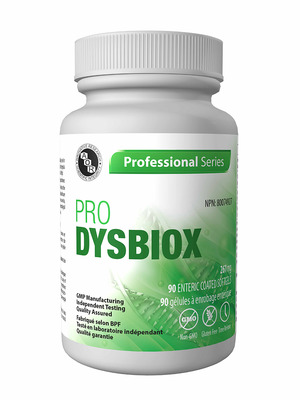 AOR Pro DysbioX is an enteric coated, high potency peppermint, thyme, and oregano oil formula, in an ultra clean, talc-free, enteric coating. Offering practitioners an evidenced-based, targeted treatment options for a host of gastrointestinal concerns. CAUTION: Caution for use beyond 1 week, if symptoms persist or worsen. Caution in patients with anaemia, gallstones, hiatus hernia or gastroesophageal reflux. Some people may experience gastroesophageal reflux. Hypersensitivity (e.g. allergy) has been known to occur; in which case, discontinue use. Do not use if you have hypersensitivity or are allergic to herbs in the Lamiaceae family-such as basil, hyssop, lavender; perilla, mint, rosemary, sage and thyme. Pregnancy/Nursing: Do not use if you are pregnant or breast-feeding.